Reach Thousands of Visitors by Educating Others About Your Attraction or Event. In summary, the Eureka Springs’ Tourism Trade Show provides a unique platform to ensure your strengths are known by those who interact with our Visitors the most! Q: Who will be at the Trade Show? A: All Attraction Operators and many Event Producers. Q: Who attends the Trade Show? A: The Eureka Springs Tourism Trade Show is open for all “Front Line” employees and staff, Owner/Operators, and Managers. The Eureka Springs Chamber Of Commerce, CAPC, Eureka Springs Main Street, Rotary, Kaptains Club, Krew of Krazo, and other local organizations will be spreading the word and encouraging anyone who interacts with Visitors to attend. Many lodging operators and restaurants will be requiring staff to attend. 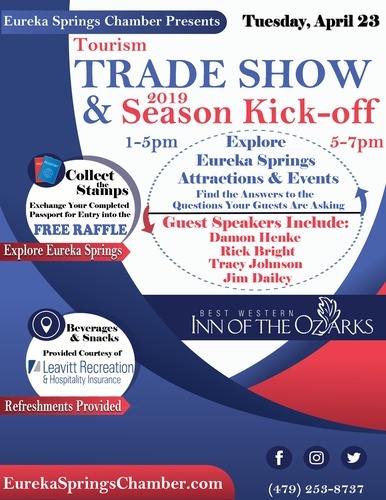 You will be placing your “Top 5 Highlights” in front of pre-qualified attendees looking for information about attractions and things to do in Eureka Springs. Providing key points about your attraction or event ensures that we are all telling Visitors what you want them to hear! Visitors actually experience Eureka Springs the way WE tell them to: “Go see…” or “Don’t miss…”. Word of mouth referrals account for a large percentage of attendance for attractions and events. As we all start saying the same things about our Destination, Visitors will follow our lead and experience more of what the overall destination has to offer. We will potentially be improving the way Visitors view the world around them. At Eureka’s Tourism Trade Show, you’ll meet face-to-face with your in-town marketing staff. Front line employees, managers, and owner/operators want your information so that they appear to be experts. Everyone prefers to answer questions competently. In the end, this will provide a better Guest experience for tens of thousands of our Visitors. Eureka’s Tourism Trade Show will include attraction operators and events both large and small. We need every Attraction to attend the Eureka Springs Tourism Trade Show. The destination includes an extensive list of things to do, and it is important to be able to relay this information to our Visitors in hundreds of outlets. You can be confident that by exhibiting at Eureka’s Tourism Trade Show, you’ll earn the reputation as a team player who wants to be included as part of an overall destination. Stay for the energetic Season Kickoff Presentation at 5:30 pm. Top 5 things to provide synergy in marketing a destination.